HONG KONG, Apr 27, 2018 - (ACN Newswire) - As part of the Hong Kong Trade Development Council (HKTDC) drive to help businesses find opportunities in Belt and Road markets, a Hong Kong-Shanghai joint infrastructure investment delegation to the Philippines and Indonesia was organised this week to discuss cooperation and investment opportunities driven by growing intra-regional cooperation in Asia. The mission, organised by the HKTDC in association with the Shanghai Federation of Industry and Commerce, comprised some 40 investors and services professionals from Hong Kong and Shanghai. The delegates included those with interest and expertise in finance, consultancy, architecture, energy, waste and water treatment, engineering and construction, legal and accounting, transportation as well as other sectors. During the 23-24 April Manila visit, the delegation met with the Philippine National Economic and Development Authority, the Philippines Economic Zone Authority, the Department of Trade and Industry and various other departments as well as Philippine business leaders and project owners. Project presentations and networking sessions were held in which Hong Kong and Shanghai delegates representing the investment, financial and professional services sectors had in-depth discussions with local investment agencies and project owners to identify areas for cooperation and development in infrastructure. During the 25-26 April Jakarta visit, the delegation met with Indonesian government departments including the Ministry of National Development Planning Board and the Ministry of Transportation, as well as key local developers such as Jababeka Group. Hong Kong Chief Executive Mrs Carrie Lam delivered a keynote speech at the "Indonesia-Hong Kong Strategic Partnership on the Belt and Road Initiative" seminar and luncheon, co-organised by the HKTDC, the Chinese General Chamber of Commerce, Hong Kong (CGCC) and the Indonesian Chamber of Commerce and Industry (KADIN), and an MoU was signed between the HKTDC and the Indonesian Investment Coordination Board (BKPM) to further promote investment cooperation between Indonesia and Hong Kong. Networking sessions were held for Hong Kong and Chinese mainland investors and professionals to discuss collaboration opportunities with Indonesian developers and project owners. HKTDC Chairman Vincent HS Lo said the Belt and Road Initiative is a huge undertaking and the complementary strengths of Hong Kong and Shanghai offer a powerful combination of expertise, capital and production capability that can provide comprehensive solutions to the large, complex projects in the Belt and Road. "Indonesia, being the biggest economy in Southeast Asia and a founding member of the ASEAN community, plays a very important role in shaping the Belt and Road," said Mr Lo. I am pleased that the long-time trust we have shared with Indonesia will give us a head start to work together. The Philippines is one of the fastest growing economies in ASEAN and has a young workforce. Offering a combination of capital, professional expertise and production capability from Hong Kong and Shanghai, we hope to collaborate with partners in these two countries to turn investment opportunities into viable ventures." Co-Mission Leader Dr Jonathan Choi, CGCC Chairman and Chairman of Sunwah Group, said: "The delegation is impressed by the prospects of upcoming projects in the country. Apart from capital needs, we also see high demand for total solutions for infrastructure development. In our delegation there are representatives of a wide range of services providers, from architectural and engineering, construction, information technology, project management and operation to legal and risk managements. They are ready to contribute their expertise to the planned development projects." Shanghai Mission Leader Lin Kaiwen, Vice Chairman of the Shanghai Federation of Industry and Commerce and President and CEO of Shanghai Kaiquan Pump (Group) Co. Ltd, said: "During our visit, we see that the economies of the Philippines and Indonesia are stable and developing rapidly. Hong Kong is very well connected in both countries. We hope to strengthen our cooperation with the HKTDC to help Shanghai enterprises explore opportunities in overseas markets. My company will further expand its operation in Hong Kong to leverage the city's advantages as a 'going out' platform." 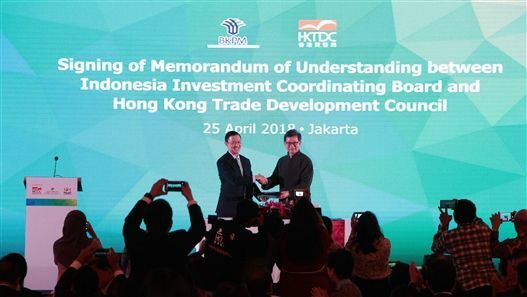 Hong Kong Trade Development Council (HKTDC) Chairman Vincent HS Lo (R) and Chairman of the Indonesia Investment Coordination Board (BKPM) Thomas Lembong signed a memorandum of understanding to further promote investment cooperation between Indonesia and Hong Kong in Jakarta on 25 April.